In order to make your way into my heart, you must be functional, straightforward, and free of baggage. Following these criteria, I fell in love with the Brookstone Pocket Projector. This iPhone 4 accessory combines my two favorite things: convenience and entertainment. Perhaps even more important, it keeps my kids quiet for hours. The appeal of this pico projector is that it does not require its own bag of accessories. It simply piggybacks onto my iPhone, leaving my hands free for the innumerable tasks of a mom on the go. From impromptu movies in the backyard to slideshows at team victory parties, I have been equally impressed with both its image quality and utility. When the projector arrived, I was thrilled to find a one page user manual written for not only the techies of the world, but also for those who still have no idea what USB stands for. This device is easy. I charged it via my computer's USB port. I slid my cherished iPhone into the projector and set off to conquer the world. Weighing about the same as a travel size bottle of hand sanitizer, the projector added no weight to the duffle bag I call a purse. It mingled nicely with the Nintendo DS and bottle of Motrin that accompany every adventure. I knew this accessory was gold when my six-year-old used it to watch Netflix movies on the back of a folding sports chair while attending his brother's soccer tournament. After the final game, the parents and players were able to relive the victory through a team slideshow projected onto the side of a minivan. Ideally, the picture is best when you have a smooth, white surface, but in my family, it is all about using what is available at the moment, and this device completely adapts to its environment. A terrific surprise came after a week of using my pocket projector for picture slideshows, home videos, soccer skills training, and countless episodes of Smurfs on YouTube. While playing a heated game of Temple Run, my iPhone's battery was threatening to sabotage my mission. However, with my iPhone still docked in the projector, I was able to simply slide its power switch to the "Charge" setting, and the projector charged my phone. Yes, you read me correctly. It went above and beyond the call of duty. If it were a man, I would have married it. Not only can this accessory display a beautiful 50 inch image onto the backyard fence but it can double as a quick charger while you search for that always elusive power cord. All joking aside, this is pure genius. Having already professed my love and affection for this projector, as is the case in most relationships, I'd make a couple of changes if I could. First, the focus wheel is tedious. For such a remarkable device, the wheel seems somewhat prehistoric. It was difficult to adjust without having to pick up the device and elicit angry comments from the peanut gallery. Like many of its pico projector brethren, the volume is weak. It simply cannot stand up to a group of 9 year old boys cheering on Harry Potter. Your kids will be forced to practice their "quiet voices." Finally, with a retail price of $230, weighing the value of this device in one's life becomes very individual. In the busy life of this mom, it serves way too many purposes and warrants the two months of shaken iced teas I had to give up to buy it. The true beauty of the Brookstone Pocket Projector for iPhone 4 is that the complexity of the device is fully hidden from the end user. They have found a way to take the complicated, yet truly amazing pico projector technology of Texas Instruments and turn it into a must-have accessory. We all know that the goal of pico technology is integration into smartphones. Until such time, this is the next best thing. Great to see the real world application here! I found this article entertaining s well as informative. I have been looking for product like this projector. As a working mom entertainment is necessary for down time with my away games with my son"s soccer team. I don't have the time to think ahead this fits. I am not a tech person and like to read what real people think. I research everything before buying this was a breath of fresh air. I could relate. does it work for presentation using the iPhone? am a realtor and would good if I can use for presentation- been also looking at Microvision Show WX- but this iPhone Projector has nothing else to lug around. Have you tried getting this to work with an iPhone 5 and a Lightning adapter? I did. Could not get it to work. I was hoping that maybe you did and had better luck. I feel like an idiot. Everyone loves this product, but I can't make it work. I carefully read and followed the instructions. With the unit fully charged I plugged in my iphone. The Brookstone logo comes up on the wall and then....nothing...just a blue square...no picture. I get the picture on the iphone, but nothing is projected. What am I doing wrong? Brookstone only offers to take it back for credit...no tech support at all. Same exact thing with me!!!! This OBVIOUSLY won't work with the iPhone 5. I has been OVERLY AND WIDELY discussed that the lightning adapter does not support video.. Do you people not even ATTEMPT to research basic answers on your own? I just bought this product and have been able to get it to work, but only sporadically. I have had some success turning the projector of and on while the video is running and also sliding the phone off and on with video running and projector on. Sometimes I get the blue projection, sometimes the video, and sometimes my phone gets an error message that the product is not designed for my phone. I read somewhere that the projector does not work at all with iOS 6 (which is not entirely my experience), but I have not tried downgrading to iOS 5, which possibly is the software that the projector was designed for. 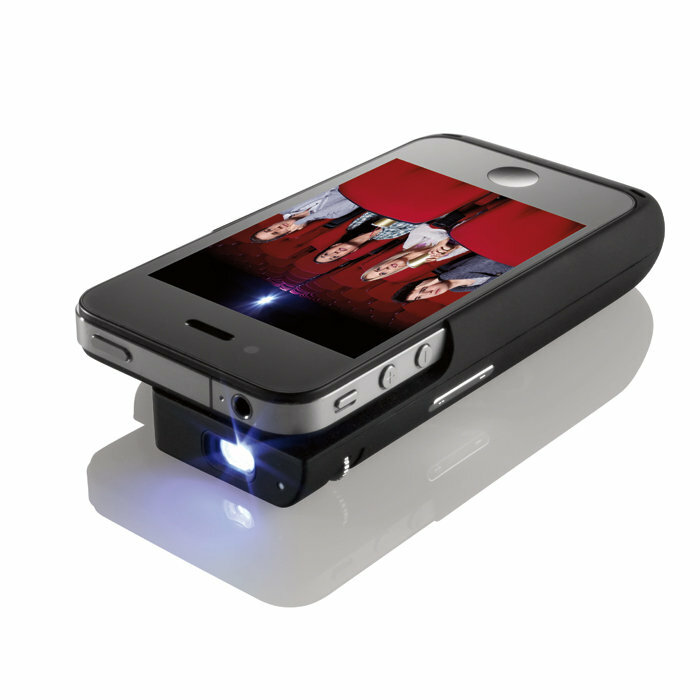 hi, can I know which is the best iphone apps for Brookstone Pocket Projector for iPhone 4? I can show video but strangely not still photos...what could be wrong? WHATS THE IOS YOUR USING ? Hello, i having also the telstar mp07 projector,but on my iphone4 it doesn't work. projout says ''device not found'' its working on ios 7.0.4.
on a iphone 4S ios 7.0.4 it works fine,also on my ipod touch4G ios 6.1.5 its working.. i have tested my iphone4 whit itunes a cheked if there a problem whit my dock connecter and no defect.found. what can it be thats it doens't make a connection? projout doesn't work unfortunately. what apps can I use to use my projector with my iPhone 4S since they removed they "Go Universal" app? I can't get my brookstone projector to work.. I was so pumped to get it and now I cant get it to work with my phone. when I turn it on all I get is a blue screen... really bummed out can anyone help??? I've also been unable to use the Brookstone projector since the IOS updated to 7 and it's really unfortunate. This is one of those gadgets that you really don't want to loose. I've done everything including attempting to hack my phone but nothing has worked. It's a genuine loss. I hoped to find an app that would bridge the gap. Brookstone should really have this link in their product listing. Same problem. Shame on brookstone ? it only works with netflix. Hey everyone - I'm on ios 7.1.2 and I have the answer for you! Ymplayer lite works for everything except straight web browsing. You can load streaming videos from youtube etc though. What is ymplayer lite? There is no entry for it in the app store and pretty much nothing comes up when googling it. As far as I can tell, this device is a paperweight. The manufacturer went out of business and never upgraded the drivers for it and since iOS went to v7 (not to mention v8), the device isn't recognized at all and will not output any video from the phone whatsoever. Has anyone managed a hardware hack for it? Found another compatible app... "Video Tube" will play out to the projector and accesses YouTube videos.